You guys, I just GUSHED about this series over on the Broke and the Bookish yesterday. But in case you haven't seen that, let me remind you how much I enjoyed The Demon King, The Exiled Queen and The Gray Wolfe Throne. So, now that you're all linked up, I'll start with the actual review. Or gushing. Either. 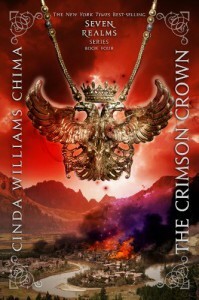 I love this world that Cinda Williams Chima has created. I love it so much that even if it's incredibly dangerous and I'd most likely be killed, I wouldn't think twice about going there given the chance. It's so rich with different cultures and people, I just love it. Han and Raisa cannot seem to catch a break, the odds are so against them that I was almost ready to give up hope for a happy ending. But I'm an optimist at heart, so of course I had faith in them to make it work. Even with pretty much everyone out to kill them. I love how both have matured over the series and I loved the few scenes they had together. It's not easy, but they share a love that's true and it's enough. This final instalment had me on the edge of my seat most of the time, there's never a time when you can rest easy, because there's always some new trouble lurking around the corner. I almost decided to cancel plans with my family in order to read on, but managed to resist. This story was in my head the whole time I WASN'T reading it and that to me is the sign of a good book and wellrounded characters, when they can exist not only in the author's imagination, but in mine as well. I feel very passionate about this series and all of its characters, be they good guys or bad guys. I wish horrible, painful, slow deaths on the ones I consider bad guys. I really hated Micah in The Demon King, but over the books he's sort of grown on me. I still wish he were different, but I don't hate him with the same passion I do his father. His character has hidden depths and I do believe he really loves Raisa, even though he way he shows it isn't really ideal. There were some twists and turns that surprised me, which I loved and I also really enjoyed learning more about Alger and Hanalea's story. The way their story got remade makes me wonder how history will be taught in a couple of centuries. Basically, this series is just plain awesome and you all have to read it. Reading The Crimson Crown felt like reconnecting with old friends, I cannot believe how much I've missed the Seven Realms and its characters! I repeat the statement I made on The Broke and the Bookish yesterday: this is YA fantasy at its best and it doesn't get much better than this. Thank you Cinda Williams Chima, for sharing this amazing story!